19 June 2018. Houston, Texas. Mayor Sylvester Turner celebrated Eid al-Fitr, the festival that marks the end of Ramadan at a Dawoodi Bohra masjid (mosque) on Monday. The mayor has a warm relationship with this Muslim community that became even stronger during Hurricane Harvey, when the masjid kitchens prepared and delivered over 10,000 hot meals to the evacuees at George R. Brown Convention Center, along with other assistance to the city. 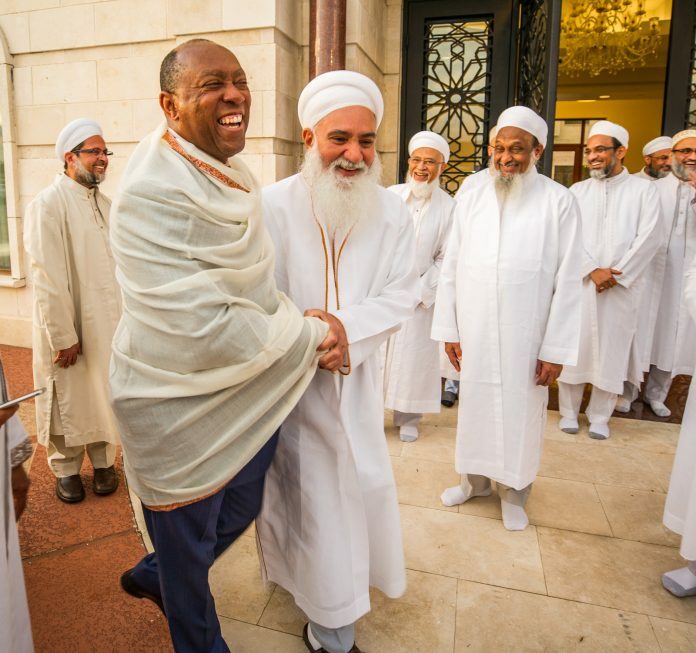 Friends of the Bohras who attended included Art Acevedo, Chief of the Houston Police Department and US District Judge Vanessa Gilmore, candidate for Congress Lizzie Fletcher, the Consul General of Pakistan and pastors from neighboring churches. Dawoodi Bohra Muslims follow the guidance of their spiritual leader His Holiness, Dr. Syedna Mufaddal Saifuddin who lives in India. His brother, Prince Malekul Ashtar Bhaisaheb Shujauddin lives in Houston, and welcomed the mayor to the masjid. “Our community has been in Houston for fifty years,” said Mohammed Zakir, a spokesperson for the Prince. “We couldn’t have this masjid here without the friendship and cooperation of our neighbors and government and fellow Houstonians, and tonight, we are celebrating that spirit of fellowship.